"It seems likely that we shall all be ejected from the I.D. but there is another scheme on hand which will absorb us. And it's probable that I may go on for a few days to India towards the end of the month." Letters 1/1/1916 - Gertrude Bell Archive, click the marker to read the letter. "I've suggested that I should go up in the Shatt al 'Arab with a local man and check the maps and they seem to think it would be a good plan." Letters 16/4/1916 - Gertrude Bell Archive, click the marker to read the letter. "I have got hold of the maps and am now bringing them out in an intelligible form, but that is only one among the many odd jobs which I do." Letters 14/5/1916 - Gertrude Bell Archive, click the marker to read the letter. Photographs K_046 (1909) - Gertrude Bell Archive, click the marker to view the photo. Sheikh in tent at Gertrude Bell's camp, with hookah. 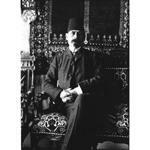 Photographs P_085 (1911)- Gertrude Bell Archive, click the marker to view the photo. Possibly Sheikh Tahir ul Jezairi. Photographs B_085 (1905) - Gertrude Bell Archive, click the marker to view the photo. "Now you know my circle - it's very friendly and pleasant, but Mr Hogarth leaves next week which will make a terrible gap in it." Letters 30/11/1915 - Gertrude Bell Archive, click the marker to read the letter.
" Marseilles, Sat. Nov 20. P&O. Arabia. Dearest Father. I've arrived safely so far. We got here at 9 but the ship didn't arrive till 12." Letters 20/11/1915 - Gertrude Bell Archive, click the marker to read the letter. "I'm taking all my kit; he quite agrees that it is as well to be prepared." Letters -/11/1915 - Gertrude Bell Archive, click the marker to read the letter. Gertrude Bell: The Arabian Diaries, 1913-1914 (2000). Lieut.-Colonel Doughty-Wylie awarded the Victoria Cross. Colonel Doughty-Wylie, who, with a little cane in his hand, had led the attack all the way up from the beach through the west side of the village. The VC and DSO Volume I, page 170-1.
and German archaeologists at dinner table. 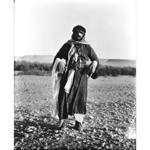 Photograph Q_225 (1911) - Gertrude Bell Archive, click the marker to view the photo.